Wayman Aviation Academy and CFI Bootcamp announced today at the Flight School Association of North America conference that they will guarantee an interview for all graduates of CFI Bootcamp’s certification program. Orlando, FL, February 14, 2019 --(PR.com)-- Wayman Aviation Academy and CFI Bootcamp announced today at the Flight School Association of North America conference that they will guarantee an interview for all graduates of CFI Bootcamp’s certification program. 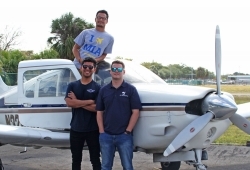 Wayman Aviation recognizes the quality of the Certified Flight Instructors, which are always in need, to combat the pilot shortage. Both schools have cooperated on CFI training for over a year at Wayman’s facilities in Miami, Florida. CFI Bootcamp specializes in training certified flight instructors through a rigorous hybrid online and in person training. Students complete an intensive 7 day 42 hour program and then 1 week of intensive flight training. Students often complete checkrides at the end of the second week. Wayman Eddy Luy, Vice President, says, “Nationwide the CFI Checkride has a 30% pass-rate, CFI Bootcamp is able to flip that to a 70% pass rate.” Specialized instructors that only focus on CFIs with a full-time approach is the key.